Inteli-Power 4600 series lower section replacement /upgrade converters for RV power systems are as close as you can get to a "universal" replacement. The 4600 series converters can be used to replace the lower section converters in Magnatec, Parallax and WFCO. Inteli-Power 4600 Series RV power converter models can recharge your battery to 90% in 2-3 hours using our patented Charge Wizard technology. The 4600 Models feature a built-in Charge Wizard that automatically selects one of four operating modes: BOOST, NORMAL, STORAGE, DESULFATION. The 4600 Power Converter BOOST Mode 14.4 Volts - Rapidly brings RV battery up to 90% of full charge. The Intelli power 4600 NORMAL Mode 13.6 Volts - Safely completes the charge. The Progressive Dynamics 4600 STORAGE Mode 13.2 Volts - Maintains charge with minimal gassing or water loss. 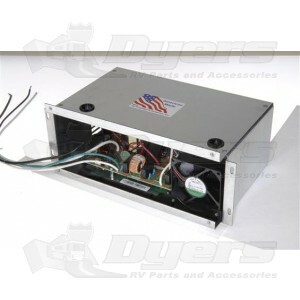 The 4600 Series RV converter has a DESULFATION Mode 14.4 Volts every 21 hours for a period of 15 minutes to prevent battery stratification.